(Nanowerk News) Researchers at the U.S. Department of Energy's Brookhaven National Laboratory have observed a new way that magnetic and electric properties — which have a long history of ignoring and counteracting each other — can coexist in a special class of metals. These materials, known as multiferroics, could serve as the basis for the next generation of faster and energy-efficient logic, memory, and sensing technology. The researchers, who worked with colleagues at the Leibniz Institute for Solid State and Materials Research in Germany, published their findings in the July 25, 2011, edition of Physical Review Letters. Ferromagnets are materials that display a permanent magnetic moment, or magnetic direction, similar to how a compass needle always points north. They assist in a variety of daily tasks, from sticking a reminder to the fridge door to storing information on a computer's hard drive. Ferroelectrics are materials that display a permanent electric polarization — a set direction of charge — and respond to the application of an electric field by switching this direction. They are commonly used in applications like sonar, medical imaging, and sensors. The crystal structure of YMn2O5, which is made of yttrium, manganese, and oxygen. The oxygen atoms are shown in red and the yttrium atoms are gray. The magnetic moments on the manganese are shown as arrows. Ferroelectric polarization occurs between the oxygen and manganese atoms. "In principle, the coupling of an ordered magnetic material with an ordered electric material could lead to very useful devices," said Brookhaven physicist Stuart Wilkins, one of the paper's authors. "For instance, one could imagine a device in which information is written by application of an electric field and read by detecting its magnetic state. This would make a faster and much more energy-efficient data storage device than is available today." But multiferroics — magnetic materials with north and south poles that can be reversed with an electric field — are rare in nature. Ferroelectricity and magnetism tend to be mutually exclusive and interact weakly with each other when they coexist. Most models used by physicists to describe this coupling are based on the idea of distorting the atomic arrangement, or crystal lattice, of a magnetic material, which can result in an electric polarization. Now, scientists have found a new way that electric and magnetic properties can be coupled in a material. 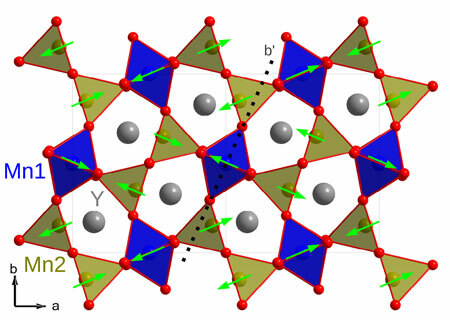 The group used extremely bright beams of x-rays at Brookhaven's National Synchrotron Light Source (NSLS) to examine the electronic structure of a particular metal oxide made of yttrium, manganese, and oxygen. They determined that the magnetic-electric coupling is caused by the outer cloud of electrons surrounding the atom. "Previously, this mechanism had only been predicted theoretically and its existence was hotly debated," Wilkins said. In this particular material, the manganese and oxygen electrons mix atomic orbitals in a process that creates atomic bonds and keeps the material together. The researchers' measurements show that this process is dependent upon the magnetic structure of the material, which in this case, causes the material to become ferroelectric, i.e. have an electric polarization. In other words, any change in the material's magnetic structure will result in a change in direction of its ferroelectric state. By definition, that makes the material a multiferroic. "What is especially exciting is that this result proves the existence of a new coupling mechanism and provides a tool to study it," Wilkins said. The researchers used a new instrument at NSLS designed to answer key questions about many intriguing classes of materials such as multiferroics and high-temperature superconductors, which conduct electricity without resistance. The instrument, developed by Wilkins and Brookhaven engineers D. Scott Coburn, William Leonhardt, and William Schoenig, will ultimately be moved to the National Synchrotron Light Source II (NSLS-II), a state-of-the-art machine currently under construction. NSLS-II will produce x-rays 10,000 times brighter than at NSLS, enabling studies of materials' properties at even higher resolution.